Going through pregnancy and knowing you’re soon going to be a new mother, or a mother all over again, can really be a daunting task unto itself. Making it through your third trimester knowing that you’re planning to go through surgery to give birth – on purpose – can be extremely stressful for even the calmest, most well-prepared mothers. So how do you pack up and head for your appointment at the hospital, all the while keeping your cool? By preparing yourself mentally. If you know what you’re in for, most of the scare factor goes away. Board-Certified OB/GYN, Dr. Charise Shively of Norton OB/GYN Associates in Louisville, Kentucky, helps to put your mind at ease by telling you everything you need to know so you can rest easy the night before. She can speak both from a doctor’s standpoint, and from experience. She, herself, experienced a planned c-section just a short while ago. Why Plan For a C-Section? Planned c-sections are becoming increasingly more common these days. There are many reasons why a woman may choose to or be required to undergo a planned c-section. 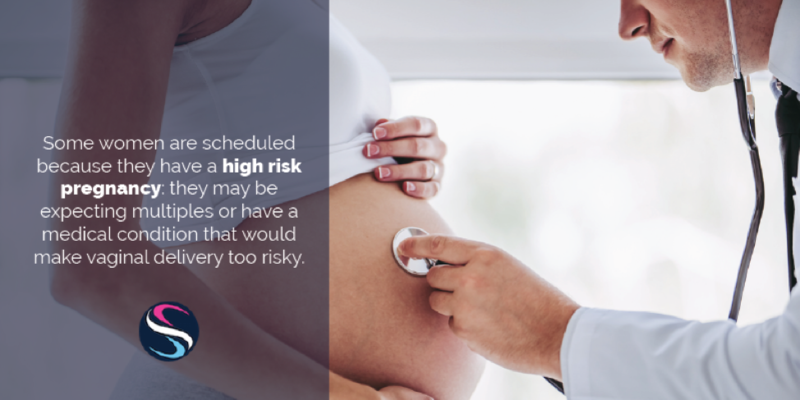 Some women are scheduled because they have a high risk pregnancy: they may be expecting multiples or have a medical condition that would make vaginal delivery too risky. Women who delivered previous children through c-section usually elect to have a planned c-section for consecutive children because a vaginal birth can put them at risk. Breech presentations are encouraged to deliver via c-section. This was the case with Dr. Shively’s baby. Easier said than done, right? Going into a c-section, there can be a lot of anxiety surrounding the experience: having a new baby to take care of, wondering just how much pain you’re going to be in, wondering if you’re going to go through any of the complications that your doctor talked about, and so much more. There really is a lot that weighs on your mind. But relaxing prior to your procedure can really help you get through it much easier! “I am a firm believer in mental health,” shares Shively. “I believe in utilizing relaxation techniques like meditation and aromatherapy.” Have a good conversation with your doctor about expectations, and chat over tea with a friend who has already been through it. It’s always a good idea to go into the end of your pregnancy, especially if it involves surgery, with a plan. Talk with your significant other about what duties they’re going to be in charge of while you’re recovering. If possible, plan to have a family member come and stay for a few days to help out. They can help take care of the baby, especially overnight, so you can get some rest. “Sometimes having a simple plan can really help to ease some anxiety,” Shively advises. What can be more nerve-wracking knowing you’re going in for a c-section soon, than to have things delayed by a couple of hours. If there are pressing emergencies going on, and you’re a healthy, planned c-section with a healthy baby, no medical issues, and everything looks great when you get to the hospital, your case may get delayed. Comfortable pajamas or loungewear if you don’t feel comfortable in a hospital gown. You’ll need to wear the gown into surgery, but you’ll probably want to have something of your own on hand for the next few days. Warm blanket, especially if you tend to get a little chilly at night. Hospital blankets have nothing on your favorite fluffy one from home. Compression Socks. Now is a good time to start to wear them, if you haven’t been already. You’ll be pretty stationary for the next day, and only moderately ambulatory for the next several. Compression socks can help to reduce swelling, prevent blood clots, and ease aches and pains. Your pregnancy pillow. You may not be pregnant for much longer, but you’re still going to want that pillow for a while. It can really come in handy as a breastfeeding pillow if you double it over, and it’s already in a curved shape. Hospital beds aren’t really known for their comfort. A pillow that can still work to support your tender belly will go a long way towards helping you sleep at night. After your procedure, you may not feel like showering for a few days, so take advantage of your comfy, warm, shower at home right before you come in. “I recommend you shower right before you leave your house,” says Shively. “I send my patients home from the office at their last visit with a little bottle of chlorhexidine soap to clean the area with at home in the shower.” It’s kind of like a pre-surgical scrub to ensure that as little bacteria as possible is present, even though the technicians will perform a thorough scrub in the delivery room before the doctor makes the initial incision. That scrub with the chlorhexidine soap at home is like an insurance step to help further prevent any infection at the incision site. “Because this is major surgery, and your doctor will be making an incision through your skin, abdomen, layers of muscles, and other tissues, you can expect to be down anywhere from two to four weeks,” shared Shively. Whether or not you’re motivated to be proactive and try to get up and move around makes a difference. Having a family member around for a week or two can really help take some worry about household chores off of your shoulders. Get up and move around the next day, once your urinary catheter has been removed. Ambulation discourages the risk of life-threatening blood clots. Eat, starting with small amounts of food and drink. Lifting anything heavier than the baby for at least four to six weeks. Vigorous exercise. Walking is the max thing you can do. “Stairs may take a day or two, so you may want to plan on hanging out on the first floor for the first couple of days when you go home,” she advised. “If you don’t follow instructions, you can have what is called a dehiscence, or a separation of sutures,” Shively explains. 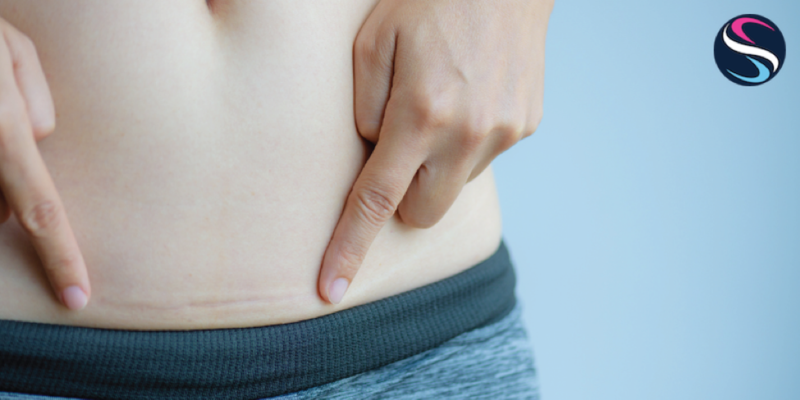 “They can pop not only at the skin, but the layers underneath, too.” A total dehiscence is rare, but if it happens, it’s a very serious emergency, requiring surgery again. You’ll receive a spinal or epidural anesthesia that will numb you from the waist down during the procedure. That can last into the next day. “Usually the second day is when you’re in the most pain,” she shared. “Try to work through it. Get up and move around to help you get through that pain.” You’ll also be given an NSAID (non-steroidal anti-inflammatory) and Tylenol. You may even want to ice the area to help with swelling. Spand-Ice’s Postpartum Recovery Wrap is designed to help you recover quickly after giving birth to your new baby, and it’s fabulous for after your C-Section. It provides compression and support that incorporates reusable heat or cold therapy. 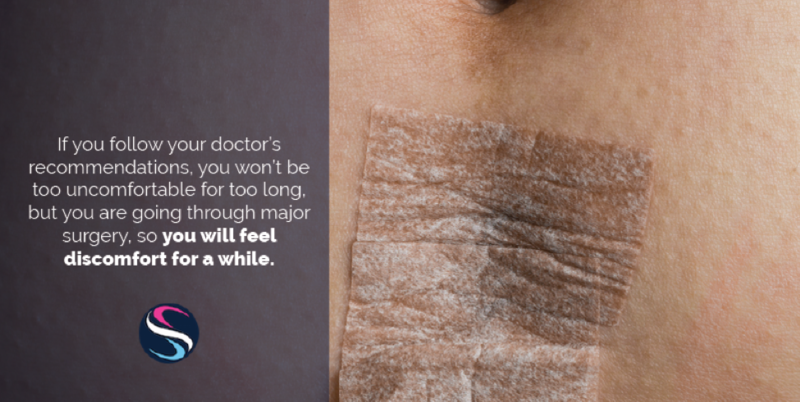 All you have to do is turn it around, taking advantage of the icy cool packs to help with your incisional pain, and provide a protective layer between your incision and the rest of the outside world. It gives a light amount of support, especially helpful in those first few days of being up and out of bed. Later, you can put it to use for anything from back pain, abdominal support for cramping, and even breast tenderness issues.